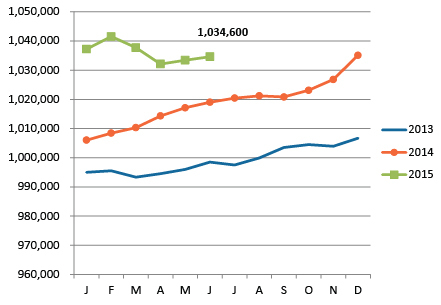 The Kansas City Metro added to its employment level in June, climbing to 1,034,600 jobs. This is up by 15,600 from one year ago. Our job growth has come from a variety of industries. Construction, for example, saw a 6 percent increase in employment, with 2,800 more jobs than one year ago. Surging construction employment indicates a growing economy, as public and private entities see value in physically investing in the region. Transportation also remains a solid job creator, adding over 2,000 jobs. But the professional and business services industry has really been the workhorse during this job recovery. Since the depths of the recession in 2007, over 22,000 jobs have been added in this sector — and over 4,300 in the last year alone. The metro unemployment rate was unchanged at 5.3 percent. This still keeps us well in the back of the pack relative to our peers, but we're better off than one year ago, when the unemployment rate was 5.7 percent. Employers are still bullish enough to advertise open positions. 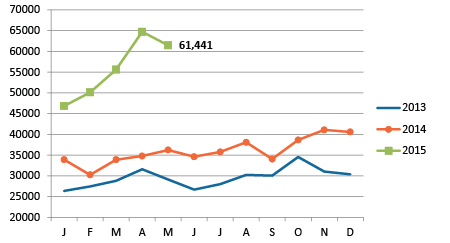 Although unique want ads dipped slightly between April and May (the most recent data available) to 61,441, that is well above the figures from one year ago. Regional employment ticked up slightly in June 2015. The metro now has 15,600 more jobs than it had in June 2014. Kansas City's unemployment rate remained flat at 5.3 percent, but is still below one year ago. NOTE: We typically use the seasonally adjusted unemployment rates here, but that data series is temporarily unavailable. The rates shown below are not seasonally adjusted. 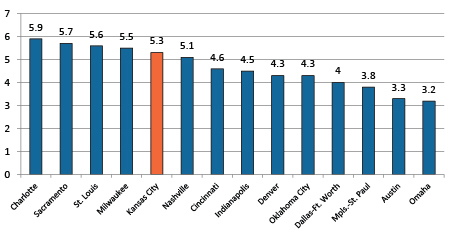 At 5.3 percent, Kansas City's unemployment rate still lags behind many of its peer metros. Only Kansas City and Indianapolis held steady from May to June; all others rose slightly. 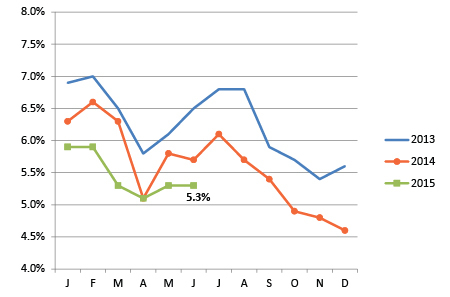 Unique help wanted ads dropped slightly in May, but they remain well above last year's numbers.